This wallpaper took about nine layers to make, to make the scan clearer, and for the background. It's supposed to be Tamaki and Haruhi in a waiting room-esque room, with Haruhi "curing" Tamaki of his love bug, or that's how I interpret it. It was hard starting the wallpaper, trying to decide what'd work best as the background or what sort of setting they should be in. Then I found a striped pattern on Deviant Art (the pattern creator's website) which then gave me the idea to put the wallpaper in a waiting room sort of room. Then, I spent a few minutes making the floor/trim. It then took me a while to decide what fonts to use, and I finally decided on "Pharmacy" and "Script MT Bold". I got the PNG (extracted image) from Kuusou PNG Archive, and then used a few filters to make the image clearer. 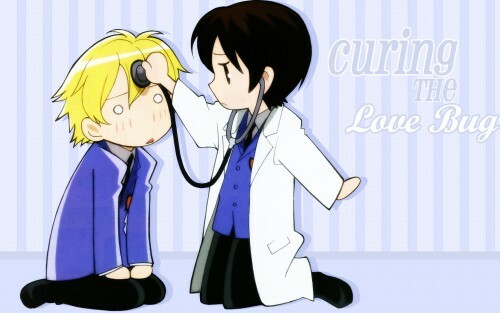 This wallpaper features Haruhi and Tamaki from Ouran High School Host Club. Ahaha~ It's so cute ^_^ Thanks for sharing! CHIBI! great wallpaper! thanks for sharing! Tamaki-sama!He never failed to make me laugh xD.